﻿ Video Converter helps you to convert movie and video files from one format to another. Video Converter helps you to convert movie and video files from one format to another. Video Converter does not require any technical experience and is very easy in use. You to get your video files converted to various formats with just a few mouse click! Program help includes step by step instruction on how to convert video files . RM format conversion with Converter Real Media. With a new version Video Converter you can make your video clips ready for downloading on any type of iPod. Fast and easy handling all parameters and settings. Support the output video formats of ASF, AVI, MPEG, MP4, MKV, RM, WMV, FLV, MOV, 3GP, VOB. Support the output devices of iPod, iPhone, Apple TV, PSP, Creative Zen, Archos, etc. All codecs are included into the program. You can change video size, bit rate, frame rate, audio/video codec, sample rate, etc. Batch conversion are supported. You can shutdown the computer after conversion completed. 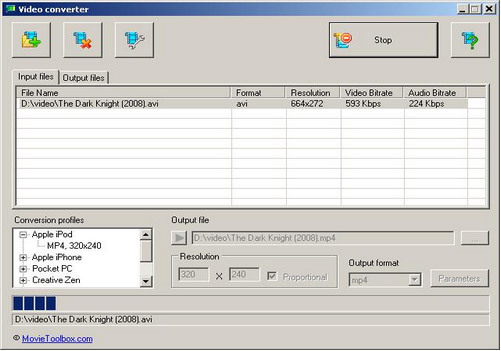 Video converter supported such video formats as: AVI, FLV, MOV, MP4, MPG, MPEG, MTS, RM, RMVB, QT, WMV and more. The unregistered version of the program converts 5 minutes of the video file. How to edit your home videos files? How to transfer video to Sony PSP? "If you need to convert so play on windows or use on phone this is the one to use." Garry Holister. Salem, Oregon . "Video converter program has its own value. I recommend it, I converted DVD to my MP4 within 2 mins, it's the best one which i have tried.." Norman Sheffild. Cloquet, Minnesita. User friendly, made at least 1 good video. Lots of ggod features and tools." Dana Smally. Chicago , Illinois.